Save energy for effective utilization of waste heat. Be environmentally-friendly, neither CFCs nor HFCs is needed. Make little noise and little vibration, because of no need of compressor. Be easy for operation and maintenance. Sprayed water evaporate on the pipes, in which water flow, in a vacuumed evaporator. And the water in the pipe is cooled by latent heat of evaporation. AQSOA adsorption heat pump produce cold water. AQSOA® coated heat exchanger adsorbs vapor from the evaporator. 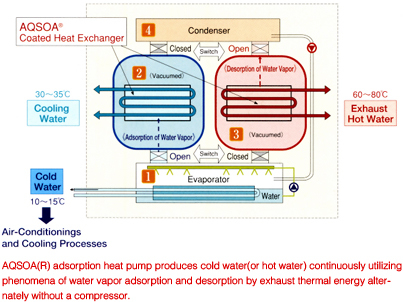 Hot water in the pipes regenerate AQSOA® on the heat exchanger. And the vapor transfer to the condenser. Vapor from the AQSOA® coated heat exchanger condenses on the pipes cooled by cooling water. Condensed water flow back to the evaporator. with silica gel adsorption heat pump and absorption heat pump. Expected Performance Ratio of The Heat Pumps with Decreasing Regeneration Temperature. 100% standard performance is defined that at 88℃ for regeneration, 31℃ for cooling water and 9℃ for producing cold water.